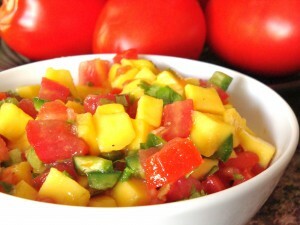 I don’t care who you are, you will love the super freshness, super simpleness and super ease of this salsa! Combine all ingredients in a bowl and let chill for an hour to blend flavours. Serve with tortilla chips or as a salsa on top of grilled chicken, pork or salmon.